The first ICO/ICTP/TWAS Central American Workshop in Lasers, Laser Applications and Laser Safety Regulations took place in Costa Rica. The University of Costa Rica hosted the workshop. 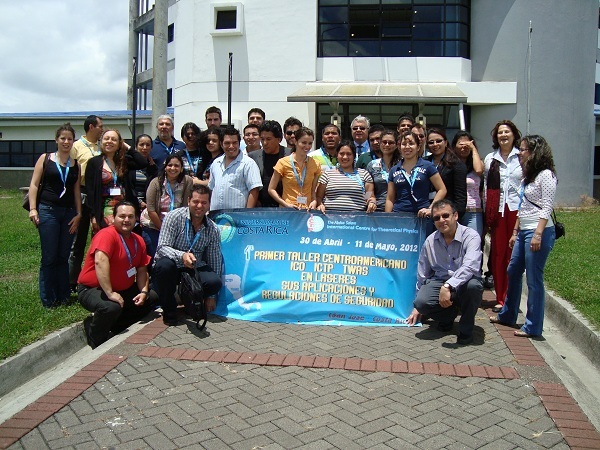 From 30 April to 11 May, the Central American Workshop in Lasers, Laser Applications and Laser Safety Regulations, organized by the International Commission for Optics (ICO), the Abdus Salam International Center for Theoretical Physics (ICTP) and the Third World Academy of Science (TWAS), took place in San José, Costa Rica. The workshop also had the support of the Ibero-American Network for Optics (RIAO) and the Latin-American and Caribbean Consortium of Engineering Institutions (LACCEI). The hosting institution was the University of Costa Rica (UCR), School of Electrical Engineering, which provided organization and infrastructure. Inauguration of the workshop. 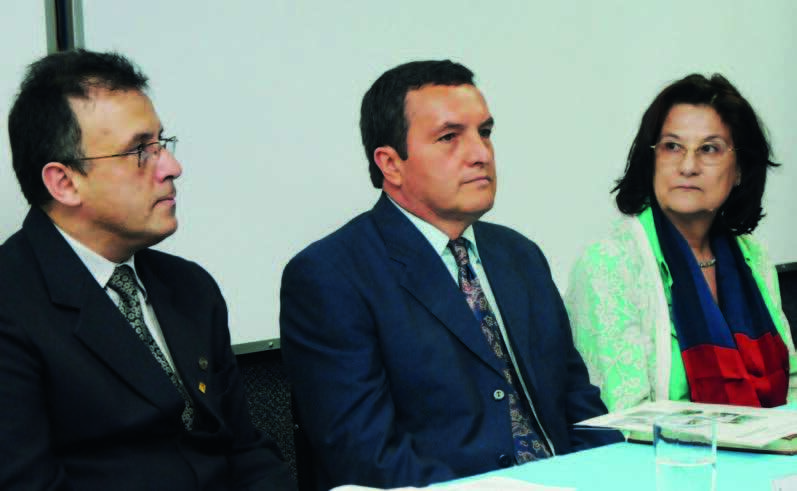 Left to right: Luis Diego Marín, local organizer, Edwin Solórzano, dean of the School of Electrical Engineering, and Maria L Calvo, one of the two co-directors and ICO past-president. The workshop was devoted to a review of fundamental concepts of laser radiation and applications to optical communications, industry and medicine, and to provide training in relevant academic and scientific areas. Its aim was to contribute, on an advanced level, to the dissemination of the relevance of optics, photonics and laser technologies in Central America as key tools for the young generation’s formation in this area of the world. The workshop included a total of 11 lecturers: Maria L Calvo, Complutense University of Madrid, Spain; Jaime Cascante, School of Electrical Engineering, UCR; Humberto Cabrera, Venezuelan Institute for Scientific Research (IVIC); Jorge Castro, Caracas Oncological Hospital, Venezuela; Angela Guzmán, University of Central Florida, CREOL, USA; Luis Diego Marín (UCR), Costa Rica; Erwin Martí-Panameño, Autonomous University of Puebla, Mexico; Iván Moreno, University of Zacatecas, Mexico; Luis Ponce Cabrera, Center for Research in Applied Science and Advanced Technology (CICATA), Mexico and Cuba; Eric Rosas, National Center for Metrology (CENAM), Mexico; and Carlos Rudamas, University of El Salvador. 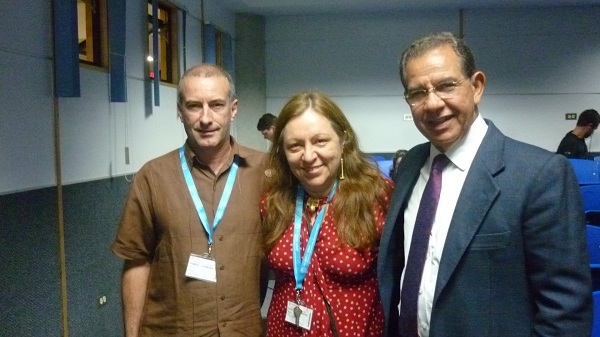 From left to right: Luis Ponce, CICATA, Mexico and Cuba; Angela Guzmán, ICO secretary general; and Manuel Limonta, director of the Latin-American regional office of the International Council for Science (ICSUROLAC). The participants totalled 32. Among them, 14 were students from the host country Costa Rica, the remainder coming from Cuba (2), El Salvador (5), Honduras (3), Mexico (4) and Venezuela (4). ICTP offered financial support to students from outside of Costa Rica, while UCR supported the local attendees. The workshop contents were divided into eight modules. The first module was devoted to the fundamentals of laser theory, coherence and resonators. The second was dedicated to laser safety regulations with special emphasis on regulations in Costa Rica and Central America. The remaining modules were aimed at applications in medicine and industry: photodynamic therapy, LED light, optical fibre communications, fibre lasers, solid state lasers, and optical spectroscopy. The lectures were complemented with classroom demonstrations and laboratory sessions, amounting to a total of 20 hours of practical training, in which the participants worked in the various set-ups installed at the laboratories of LAFTLA (Fiber Optics Laboratory of the School of Electrical Engineering). An oral and a poster session gave young researchers and senior attendees the opportunity to present their current work, in an interactive atmosphere. Participants and lecturers at the gate of the School of Laboratory session in LAFTLA, University of Costa Rica. Electrical Engineering, University of Costa Rica. 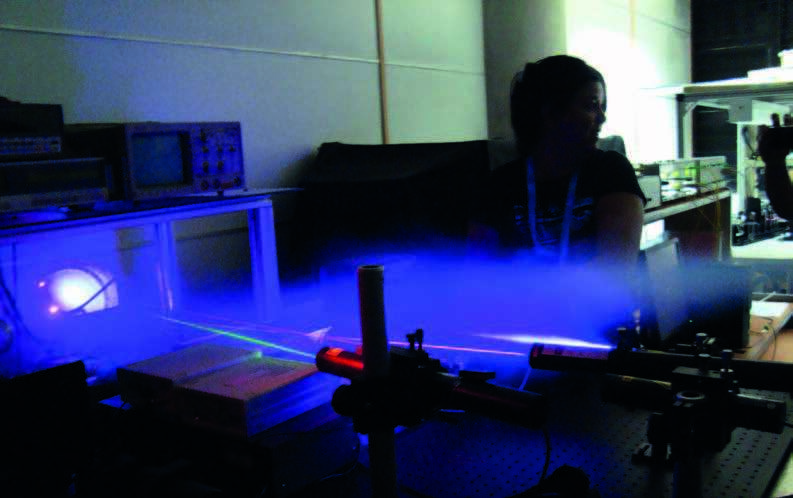 Karla Ubieta, a professor of the Autonomous University of Nicaragua, who explained the programmes in physics and future inclusion of novel topics in lasers. Laboratory session in LAFTLA, University of Costa Rica. Two special panels were organized. In the first week the panel was dedicated to the activities of ICO, ICTP, and RIAO, and possible interesting information for young researchers on future activities. During the second week panel, devoted to ICSU Latin-American regional office activities, Dr Manuel Limonta delivered a presentation on the four ICSU scientific strategic plans, namely, Biodiversity, Natural Hazards and Disaster Risks, Sustainable Energy and Mathematics Education. Also discussed was the center ICTP-MAIS (Meso-American Institute for Science), located in Ocozocoautla de Espinosa, in Chiapas, Mexico. The two directors of ICTP-MAIS, Arnulfo Zepeda and Ely Santos described the structure and research lines of this institute devoted to theoretical physics, mathematics and applications to energy. A visit to the Irazú volcano provided a very special taste of a splendid geographical area that sustains no less than 5% of the Earth’s biodiversity. This meeting also represented a good opportunity for networking with other regional scientific institutions for future collaboration activities. ICO is grateful to all scientific institutions and commissions that support this initiative, and to UCR, for the wonderful hospitality and remarkable efficiency in providing infrastructure. It is expected that the activity will continue, and the organization of a second workshop is under consideration as a natural extension of the unique ICO/ICTP/TWAS joint venture. Last, but not least, ICO expresses its deepest gratitude to Prof. Fernando Quevedo, executive director of ICTP, for supporting globally the materialization of this initiative since its inception. The ICO Territorial Committee in collaboration with CIOp and its branch of young opticians and photo physicists of Argentina made the call to discuss optics and photonics in aerospace systems. 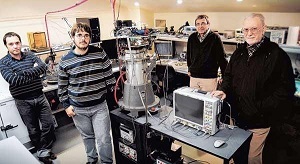 Ten years of perseverance and meticulous research activities led satellite optics and photonics at the Centro de Investigaciones Opticas (CIOp) from zero to a height of 657 km, in the words of Mario Garavaglia. The Argentinian Satellite SAC-D/Aquarius was launched on 10 June 2011, carrying navigation and attitude control systems, and microwave water radiometers designed, and built with the active participation of CIOp researchers and students. The satellite SAC-D was developed in collaboration with NASA and other space agencies. They also contributed to calibration of the NIRST (New Infrared System Technology) cameras built in collaboration with Brazil. Mario Garavaglia, ICO Galileo Galilei awardee in 1995, has been responsible for all of these developments and has led a group of young engineers in the construction of four interference fibre optic gyroscopes mounted in a non-orthogonal and redundant structure. Every year the ICO Argentinian Territorial Committee organizes TOPFOT, a Workshop of Optics and Photophysics, which this year was in its 8th year. It was preceded by a meeting of students in Optics and Photophysics (EEOF) organized by the Young Opticians and Photophysicists of Argentina (JOFA) and by the SPIE and OSA student chapters of CIOp-University of La Plata, with participation of additional students from the University of Buenos Aires. The activities were attended by 130 participants. Organizers and some of the lecturers at EEOF. Left to right: Angela Guzmán (CREOL,USA), William T Rhodes (FAU, USA), Damián Gulich (SPIE chapter vice-president), Jesica Santillán (SPIE chapter treasurer), Joseph M Howard (NASA, USA), Patricio Fluxá (OSA chapter president), Lucimara Scaduto (Opto Electrónica S A Brazil), Mario Garavaglia (CIOp). Several Argentinian authorities participated in TOPFOT. Fernando Hisas from the Comisión Nacional de Actividades Espaciales (CONAE) inaugurated the event with a talk on the Argentinean Space Program placing emphasis on the successful experience of the co-operation with the local Scientific and Technological System, and other space agencies, in particular NASA, and ASI from Italy. Juan Plá from the Comisión Nacional de Energia Atómica (CNEA) reported on solar panels based on III-IV semiconductors that were developed and integrated at CNEA for the SAC-D.
CIOp has 24 researchers, physicists and engineers whose interests cover a variety of topics in optics and photonics. During the last year the work on movie encryption by Roberto Torroba, Néstor Bolognini and Myrian Tebaldi has received much international attention, being listed in several occasions as the most downloaded from OSA. Their papers “All-optical encrypted movie”, “Pure optical dynamical color encryption” and “Experimental multiplexing of encrypted movies using a JTC architecture” refer to dynamical encoding of images. The first one appeared in OSA’s Spotlight on Optics and was considered as leading to new ways of confronting this problem. Angela Guzmán, ICO secretary general, had the opportunity to meet the event organizer and ICO territorial representative Marcelo Trivi and with the ICO territorial committee members during her stay in La Plata and to solicit their input regarding the future of ICO for the Strategic Planning Committee meeting in Genoa on 1–2 July. Prof. Annette Ladstaetter-Weissenmayer from Bremen was hosted by Prof. Carlos Rudamas in El Salvador. A group of participants in the series of lectures “Physics and Chemistry of the Environment” held in SanSalvador, El Salvador. (CENSALUD) of the Universidad de El Salvador (UES) in San Salvador, the capital city of El Salvador in Central America. The activity was carried out within the framework of the co-operation between the IUP-Bremen and the UES, and was co-sponsored by the Faculty of Natural Sciences and Mathematics of the UES and by the International Commission for Optics (ICO) within the ICO-Travelling Lecturer Program. This was also an activity of the Central American DAAD-Alumni Network for Research (CADAN:R) in El Salvador. The main goal of the lectures was to motivate and educate Salvadorian students and professionals in the application of optical techniques in environmental sciences. This is very important because environmental pollution is one of the most important problems to solve in El Salvador. Her lectures were attended by 32 students of physics, geophysics, chemistry, biology and engineering and by university teachers from the UES departments of physics, chemistry and mathematics as well as by professionals working at the Salvadoran Ministry of Environment and Natural Resources (MARN). Left: Prof. Annette Ladstaetter-Weissenmayer giving a lecture within the “Physics and Chemistry of the Environment” series of lectures. Right: she is talking with a group ofparticipants during the time for solving exercises. Environmental physics, environmental chemistry and remote sensing techniques were the main topics covered during the lectures. After each sub-topic, students had the opportunity to solve the exercises of the “e-learning module on the remote sensing of nitrogen dioxide from space” (www.iup.uni-bremen.de/deu/lehre/elearning/index.html). This module is part of the ACCENT-TROPOSAT-2 (AT2) project, which is the Satellite Remote Sensing Task of ACCENT, the European Network of Excellence on Atmospheric Composition Change. Prof. Ladstaetter-Weissenmayer is one of the authors of this module. The students had the opportunity to discuss the content of this e-learning module with one of the leading scientists in this field. It also meant that Prof. Ladstaetter-Weissenmayer had the opportunity to interact in quite a personal way with all of the students that attended the lectures. The students and Prof. Ladstaetter-Weissenmayer also visited several laboratories located at the Faculty of Natural Sciences and Mathematics and the Faculty of Agricultural Sciences where research is conducted in fields related to the main topics of the lectures. They also visited the Environmental Observatory of the Salvadoran Ministry of Environment and Natural Resources. During this week of lectures, meetings were organized to work on the preparation of future activities of scientific co-operation in environmental sciences applying optical techniques and the preparation of a postgraduate study program in this field. The series of lectures “Physics and Chemistry of the Environment” has been organized by Prof. Carlos Rudamas and his research group at the Escuela de Física (Department of Physics) of the Universidad de El Salvador. The ICO Congresses are organized every three years. The Congress consists of the General Business Meeting as requested by the ICO statutes and of a Scientific Conference that should cover the wide disciplinary field of optics in its entirety. The purpose of this letter is to solicit bids for organizing the 24th ICO Congress to be held in 2017. Usually the Congresses are organized in August or in early September. While the ICO aims that the Congresses would alternate between the various parts of the world, highly qualified proposals from all areas are encouraged and all bids will be considered. The 23rd ICO Congress will be held in August 2014 in Santiago de Compostela, Spain, with the title: “Enlightening the future”. Most recent past ICO Congresses where held in Mexico (ICO-22), Australia (ICO-21), the People’s Republic of China (ICO-20), and Italy (ICO-19). Applicants preparing their bids are referred to the Information and Questionnaire Form on ICO Congresses and other major ICO events or on the ICO homepages http://e-ico.org/node/29. Please submit your bid by completing the Questionnaire Form, including the necessary enclosures, and send it to me electronically or by airmail by 31 December 2012 for the consideration of the Bureau. Gert von Bally, ICO Associate Secretary (in charge of meetings).